Ice skating is a hugely popular activity that forms the basis of many winter sports, including figure skating, ice hockey and speed skating. Ice skating is an accessible and social pastime which offers a diverse range of health and fitness benefits. 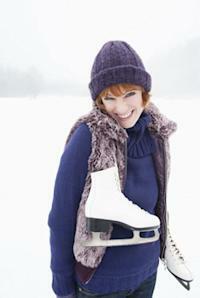 Whether you hope to improve balance, strengthen leg muscles or gain nimbler footwork, it's time to get your skates on! What does ice skating involve? Originating in Scandinavia four millennia ago, ice skating has developed over the years into a fun yet physically demanding winter sport enjoyed by millions. Ice skaters travel over an icy surface (normally an ice rink or frozen body of water) on bladed boots. Depending on the type of competition, they may race across this length of ice, or perform complex dance moves upon it. Whilst beginners may initially struggle to stay upright on a slippery ice surface, balancing the body for successful skating is really not too difficult to master. Experienced skaters move skilfully across the ice by digging their blades into its surface so that friction, and therefore control are substantially increased. Skaters can also heighten their momentum by following curved paths across the ice, carefully manoeuvring their bodies to maintain balance and quicken speed. Ice hockey — An icebound version of field hockey, this winter sport sees two teams battle it out to score the most goals. Featuring bladed sticks, a hockey puck and plenty of body padding, this contact sport is certainly not for the faint-hearted! Figure skating — This graceful sport sees individual skaters — or groups — perform a series of dance routines in time with accompanying music. Incorporating spins, jumps and fast turns, figure skating certainly offers a more artistic form of ice skating. Speed skating — This competitive individual sport sees participants race each other across a specified distance of ice. Speed skating competitions may take place over long distances, or can just be restricted to sprints. Improving joint flexibility through ice skating — If your leg joints creak every time you rise from your bed in the morning, ice skating could offer a real solution. With its emphasis on quick foot movements and supple knees, your leg joints will receive a great workout and hopefully feel more flexible in no time. Building leg muscles through ice skating — Your legs may currently resemble knobbly-kneed, trembling twigs but ice skating exercise could really change all that. Focusing on lower-body movement, ice skating offers fine exercise for the leg muscles, building them up over time. So get rid of your chicken-legged blues today by skating towards better fitness! Boosting the cardiovascular system through ice skating — Ice skating may not appear the most obvious way of boosting your cardiovascular (CV) system, but an intensive session could really work out your heart and lungs, feeding muscles with oxygen more efficiently. Keeping mentally fit through ice skating — Although offering a number of physical benefits, ice skating is equally useful for improving mental fitness. Requiring high concentration, strong memory skills and spatial awareness, your mental attributes should develop the longer your ice skating training goes on. Better balance through ice skating — If you normally topple over at the drop of a hat, ice skating could really help you improve your balance through fun and positive exercise. Travelling across an incredibly slippery surface should quickly train you to stay on your feet; otherwise you’ll be crashing to earth with a bump and receiving an icy reception! Ice skating is a hugely accessible winter sport to get involved in, with a variety of rinks and clubs offering beginner lessons nationwide. Ice skating boots really needn’t cost the earth and can even be hired at some centres. For information on finding a skating club near you, or general ice skating queries, your first port of call should be the UK’s National Ice Skating Association — the authority on all things ice skating. National Ice Skating Association (UK) Ltd.
Alternatively you can call them on the following number: 0115 988 8060.